Master Slider comes with custom capabilities that makes you able ?to allow or restrict a user to do some tasks with Master Slider. For example you can define to allow a user for accessing, editing, deleting, publishing and exporting Master Slider. Master Slider has 6 custom capabilities that makes you able to manage permissions for logged-in users. Whether the user can have access to master slider admin page or not. Whether the user can create a slider or not (the slider will be saved as ‘draft’, if?the?user has ‘publish_masterslider’ capability too then he/she can save slider as ‘published’ slider). Whether the user can publish a slider or not. Whether the user can delete a slider or not. Whether the user can duplicate a slider or not. Whether the user can import/export sliders or not. By default, these capabilities will be assigned to “Administrative” and “Editor” role when plugin runs for the first time. 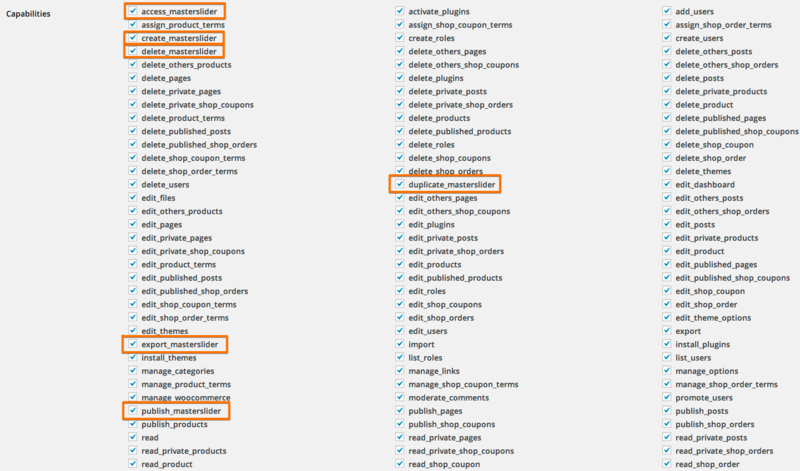 You can add or remove capabilities for user by using a great plugin named?Members. Mater Slider is fully compatible with this plugin too. 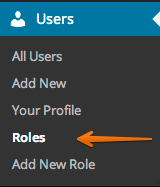 Go to your admin panel and click on “Roles” in the left navigation sidebar, under the “Users” menu? In capabilities page “check” or “Uncheck” the Master Slider capabilities that you want to change?